Welcome to Preschool/Pre-K! So many great things happen in our class! 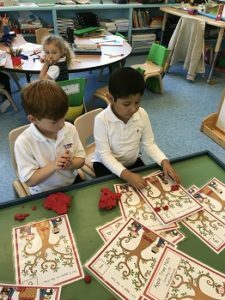 In the Preschool class, we work on self-help skills, small and large motor skills, letter and number recognition, communication, and several other cognitive and social skills. We cover these areas using a variety of methods to ensure that learning is always fun and exciting. In Pre-K, our objectives are to help better prepare your child for Kindergarten emotionally, socially, and academically in a positive and nurturing environment. Our curriculum is based on the Rhode Island Early Childhood Standard and is reflected in every aspect of our day. 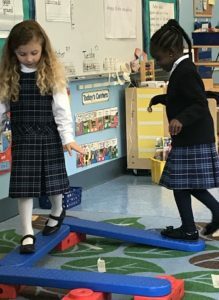 The Preschool/Pre-K classroom is divided into several areas: Dramatic Play, Art, Sensory, Writing, Math, Science, Activity Table, extra exploration table and quiet reading area. They learn to keep toys in their areas, pick up after themselves, share with and respect each other, and work together.